Almost forgot! 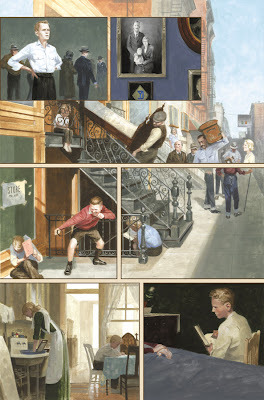 I managed to get into the Society of Illustrators show, Illustrators 51: Sequential, part of an annual competition. The show is up from January 7 - 24, with an awards ceremony Friday, January 16, from 6 - 9. 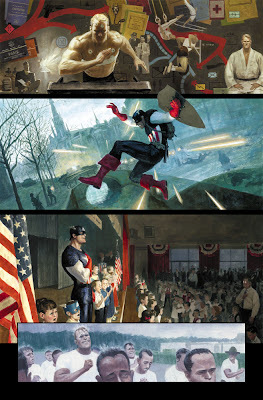 There will be 4 original pages from Mythos: Captain America, including the one featured above. I'm pretty sure they'll have artwork from other artists too. Hey, congrats! Will the show be online anywhere so we can see the rest of your pieces (and those "other" ones, too)? 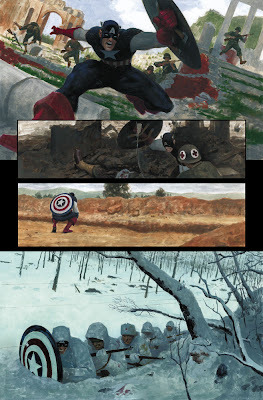 I don't know of any on-line gallery, but I just updated the post with the 4 Cap pages that will be in the show. I believe they're also publishing a catalog of the show at some point this year. You da' man, Paolo! I love that panel with Catain America saying the pledge of alegience with the kids on stage. Pure Americana, there.